So...there you are, on your path, minding your business, enjoying the beauty of life that is around you, praising the Lord for helping you see your way through the last storm, for showing you the light out of the darkness, and feeling truly blessed and happy. You forget all you have learned...you panic! You worry! You spend days pacing back and forth wondering which way to go, weighing your options, thinking about Robert Frost and whether that "road not taken" really is the best choice??? And the what-if's...and the unknowns. And you are overcome with fear. This "a-ha!" moment of sorts. You are suddenly reminded: you are not in control...there is a plan...you don't have to worry or be afraid or ask about the what-if's or think about the unknowns. This is true. The next part of your journey will serve a purpose. He knows the desires of your heart and has a plan for you. 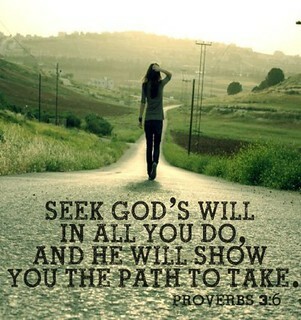 Seek His will for your life, ask for His help with your decision, and pray that no matter what, He will be there to protect you and lead in the right direction. Then, take a step down whatever path feels right. No looking back. Be confident in your decision and excited about what lies ahead. And again, take in the beauty of the world around you, praising the Lord for his many blessings and for the light that is guiding you where you are going...wherever that is.